If you’ve been making creative writing submissions and getting your fair share of rejections—an acceptance letter is cause for celebration! And while you’re doing your happy dance, tango on over to your computer keyboard to share the good news. 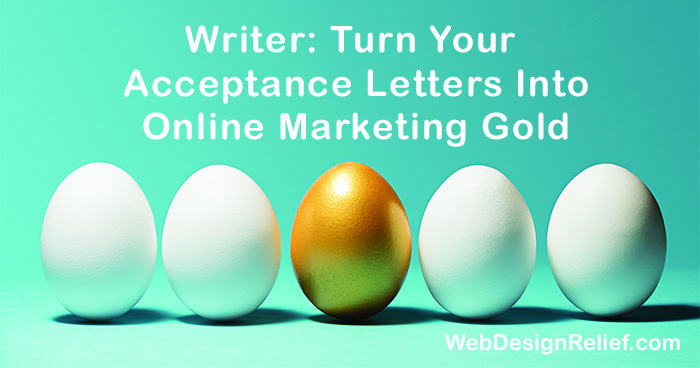 The marketing experts at Web Design Relief explain how getting an acceptance letter offers you a golden opportunity for effective brand building and promotion! Share your struggles. You may find that people are more eager to spread the word about one of your acceptances if they’ve shared the submission process with you. That means posting on social media about how you were up filling out submission manager forms until 2:00 AM. Or how you just got a new batch of rejection letters but are sharing a motivational quote that helps you stay positive. Your online presence is an opportunity to tell the story of who you are as an aspiring writer. By letting followers see your authenticity and willingness to be vulnerable, they’ll be just as excited as you are about an acceptance and eager to spread the word. And your posts about successes won’t come across as bragging. Post a screenshot of your acceptance letter. It may be a while before your accepted submission is published in the literary journal. In the meantime, share your acceptance letters! A photo or screenshot of key language in your letter is a great way to spread the word—especially on social media, where posting images increases interactions. Think outside the letter. Apart from running in circles and gleefully jumping up and down in the privacy of your home office, how are you going to celebrate your acceptance? Go out to dinner? Reward yourself with a trip to the bookstore? Whatever you decide, document it on social media and let others celebrate vicariously with you. Share works by other writers associated with your literary magazine/literary agent. Is your future literary agent supporting other writers you admire? Does the journal that accepted your work feature writing you love? Share this info on your social media pages. Not only can a “recommended read” post remind your followers that your published work is forthcoming, it can also be a great way of networking with other writers. Feature visuals or links when the piece comes out. Your publication date is cause for online celebrating! Be sure to link directly to your published work on your website announcements page or on your social media profiles. If the image that pops up from the URL doesn’t directly show your byline, post a screenshot that does. Remember, spreading the good word about a fabulous literary magazine or a wonderful literary agent isn’t simply boasting: It’s a PSA offering helpful info to others. Include links, encourage support from fans, friends, and followers, and let editors and agents know what you are doing to help their cause. You may discover additional cross-promotion potential! Question: How do you celebrate an acceptance letter?